Brent oil prices fell by 6.47% or US$4.47, as prices decreased this week. Oil traded on February 8, 2018 at a price of $64.66 per barrel relative to US$69.13 last week. Brent oil began the year at US$68.07 per barrel. 87 Octane prices decrease week over week, by 0.44% (JMD$0.54). Additionally 90 Octane fell by 0.43% or (JMD$0.54) week over week. 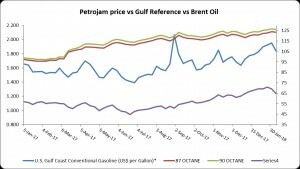 87 Octane and 90 Octane opened the year at J$121.04 and J$123.88 respectively and now trades at J$123.35 and J$126.19 per litre respectively. Crude oil prices have increased over the past seven months as oil inventories, both in the United States and globally, have fallen steadily. In January, oil prices may have received some support following the OPEC monitoring committee meeting, where some oil ministers suggested extending the production cut agreement in some form beyond the currently scheduled expiration at the end of 2018.Rapid declines in Venezuelan crude oil output are also likely contributing to higher crude oil prices. Average U.S. imports of crude oil from Venezuela declined to less than 0.4 million barrels per day (b/d) for the four weeks ending January 26, approaching the lowest level in decades. For additional information, click on link below.